Along with many countries around the world outside of the United States, Canada uses the metric system to measure the weather in degrees Celsius (C) instead of Fahrenheit (F). 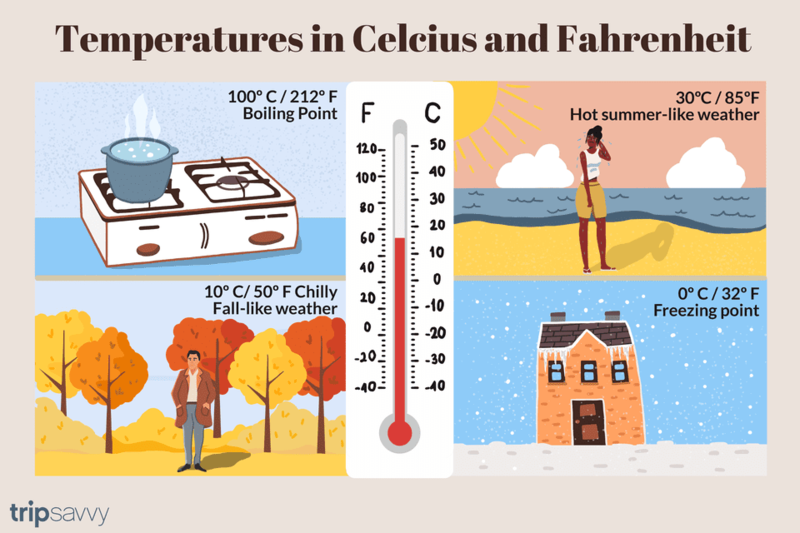 As a result, you'll want to familiarize yourself with common temperatures you might encounter before you travel to Canada. Whether you're trying to convert 15 Celsius to 60 Fahrenheit to see if you'll need a light jacket for a chilly afternoon or 30 Celsius to 85 Fahrenheit to know it's going to be a hot day, knowing how to convert temperatures between these systems will help you know what to expect. In addition to temperatures, the Canadian metric system also differs from the Imperial system of the United States when measuring weight in grams, kilograms, ounces, and pounds; distances in meters and kilometers; speed in kilometers per hour; and volume in liters and milliliters. Visitors should note that "wind chill" is a major factor that affects the temperature in cold climates like Canada, and in winter, temperatures are often presented with the wind chill factor. Thus, a weather report on a chilly January morning may report the temperature as -20 C (-4 F), the wind chill factor will make the "real feel" temperature will be closer to -30 C (-22 F). If you're not mathematically inclined, a great way to understand the normal range of temperatures in Canada is to remember this short poem: "Zero is freezing; 10 is not. 20 is warm, and 30 is hot." Just like Americans have a general understanding that 32 F is the temperature at which water freezes, 50 F is the appropriate weather for a fleece jacket, and everything over 85 F is considered hot weather, Canadians also share similar reference points for temperatures in Celsius. Don't know metric? No problem. Easy conversion for visitors. I Want To Move to Canada. Now What? How Much is the Sales Tax in Canada? Can I use my U.S. dollars when I visit Canada? Is Anything Open in Canada on Thanksgiving?